"Great Tool for Our Finance Department"
SaaSoptics has simplified the month end process by easily giving us a way to see daily revenue from our subscriptions. I like the fact that they are continuing to develop what the people want. This product has completely been designed for finance and accounting teams to understand, and use daily. The implementation was a lot of work on our end, due to the way we did our accounting in the past. This was more our fault than SaaSoptics. The time spent has quickly been replenished by the ease of use of the product on a daily basis. Jumping on board with a product with SaaSoptics will help save time in your finance department for a fraction of the cost of other systems. SaaSoptics has helped us with month end reporting and tracking our accounts receivable more regularly. We have been able to substantially decrease our receivables with the collections features. "Easy to use Software that Integrates well with Salesforce and Quickbooks Online :)"
Quickbooks Online (QBO) and Salesforce (SF) Connectors. After an opportunity in SF is marked as Closed Won I can either import the opportunity information from SF to Saas Optics (SO) for the transactions or manually enter them. Once the invoices are created you can either send through SO e-invoicing or sync to QBO and send from there. 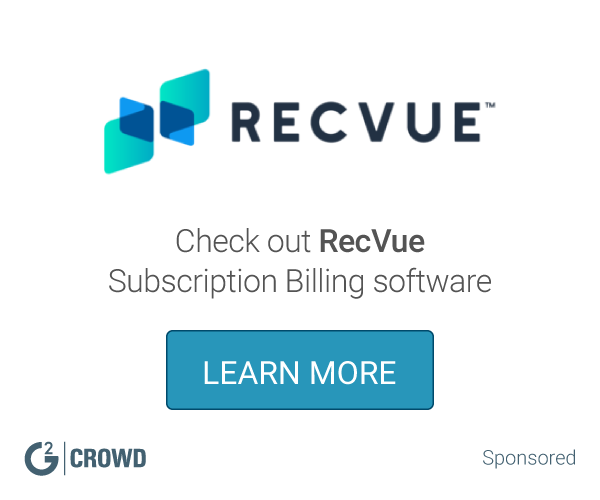 What Subscription Billing solution do you use? "SaaSOptics is a key tool for our finance team"
I've used SaaSOptics at two companies. The solution allows us to easily run rev rec and billing reports. We use the platform continually for financial reporting, budgeting, forecasting and analytics. We have found that SaaSOptics provides our external auditors with more confidence than home grown excel reports. The team at SaaSOptics provides great support from onboarding through every aspect of using the solution. There is nothing about the SaaSOptics platform that we are unhappy with. We need to use more of the analytical reporting than we do, but the issue is with our time constraints...not SaaSOptics. The short term pain of onboarding will be quickly forgotten after the first few months of using SaaSOptics. SaaSOptics has made our budgeting and cash flow planning process easy. Generating month end reports for financial statements takes seconds. SaaSOptics is as important to us as Salesforce and Quickbooks. SaaSOptics has allowed us to automate critical functions of our business, saving us time, money, and headaches. We've been a customer for over 4 years and I couldn't be more pleased. The product continues to evolve and the technical support has been fabulous. If you're trying to scale a SaaS business this is the only way to go. In earlier days I neglected to keep closely in touch with the new capabilities of the product. My excuse is that I was too busy growing our own business to pay proper attention. I spent considerable dollars looking for a financial forecasting capability I needed when SaaSOptics has already developed it and it was included in our contract. My error for sure. There is nothing I dislike about the product, and they're a terrific company. Give it an in-depth look, you won't be disappointed. We have a completely automated operations platform with SaaSOptics, QBO, Salesforce, Marketo, and InsightSquared. We have eliminated the need for human action, other than the sales process, from first touch thru collections. All our data is real-time and we are data-driven. This approach saves us valuable time and money. We're saving a lot of time using SaaSOptics for billing. The renewals and new billings flow through from Salesforce to SaaSOptics, which creates a lot of confidence around our process and has freed up a lot of time. Our implementation consultant, Paul, and the rest of the team have been extremely helpful through the whole process. The setup took a bit longer than anticipated, but after it was finished it's a great system to use. It would also be helpful to issue refunds straight from SaaSOptics and not have to go through Stripe. The biggest one for us right now is on the billing side, it eliminates room for error because of the integration with Salesforce. The deferred revenue schedule is going to be extremely helpful going forward so that we can move away from massive spreadsheets. We're also excited to start utilizing the many reports offered. * Old school mentality of how software should be built but adapted to the SaaS-based world. * Top-notch Customer Support/Success. Always feel they're invested in ensuring a successful/desired outcome. Super responsive. * Intuitive and straight-forward software. * Have ability for more Sales focused metrics. TCV as an example, is hard to gather quickly. Everything that SaaSOptics solves: Billing. Contract Management. Revenue Recognition. Metrics. Renewals. "It did what we needed!" At Haiku Learning, we needed to produce our first GAAP financial statements going back two years. We were using QuickBooks online and added SaaSOptics to get the financials we needed. We had some start up pains since our data was older and not setup for this process. Once it was going it worked fine. We needed GAAP financials, so we used the Revenue Recognition feature to turn our billed revenue numbers into GAAP revenue numbers. This allowed us to get (and pass!) our first financial audit. After using the product for a year and a half, we passed due diligence and were purchased by a much larger company so we no longer use the product. They are top notch at support and onboarding. This is a very robust solution, so it can be a bit overwhelming at first. I would like a little more customization in the look and feel of different screens, but I know they are releasing new updates to make it more user-friendly. "Saves me a day a month "
The help ? module isn't of much help. I rarely get the answer I need when I click on the question mark. Wrapping our arms around MRR, et al which we used to maintain in an "ugh" excel workbook. Manages our SAAS customers easily. Great tool for financial planning. Some reporting elements are rigid, can't customize fully. Finally a SAAS tool for finance! Been looking for a while for easy tool to manage our SAAS business. This has helped enormously with renewal management and financial planning. "Love the System- No regrets"
It's a software that helps track your Monthly revenue. No more spreadsheets- a system that has it in place. I really love the software so there's few to dislike. If anything, I would say the inability to review the information at a snap shot in a prior time would be my complain. You have to take time to understand the system, but once you do it's amazing. It helps track your monthly recurring revenue accurately and has the ability to make future projections. "Converted from manually tracking subscriptios and recurring revenue to SaaSoptics"
Integration to Quickbooks Cloud that eliminated manual effort, reduced errors and provided easy to access automated reports. Recently went through a financing round and having subscription revenue information readily available was very beneficial. Define key scope and objectives prror to starting, have a clear vision of how you see deployment. Accurate deferred revenue accounting, tracking MRR and forecasting future renewal billings for cash flow. "QuickBooks Enterprise to SaaS Optics"
Automated revenue recognition, reporting and ease of use. We are not easily able to invoice out of SaaS Optics. Good intermediary for quickbooks users. Revenue schedule need to be moved from excel spreadsheets to a stable platform. Benefits have been ease of reporting and accurate MRR/ARR calculations. The care and compassion of the team to understand and do what is best for our company. That I had to stop my weekly calls with Cindy Carson. We became fast friends. Reporting and time savings on recording deferred revenue. The implementation process and sending invoice process. It has really made the reconcilation between SF and SaasOptic seamless. "saas optics - great time savings"
reporting is great from a performance point of view. "I love the way the Revenue Recognition provides me with the information in a quick snapshot"
I like the way it provides all my financial and revenue recognition information upfront. Data migration took longer than I expected from our data which was on a spreadsheet. Faster and quicker access to my information and knowing it is accurately calculated without room for errors. "Excellent but sometimes very rigid"
* We monitor all SaaSoptics reviews to prevent fraudulent reviews and keep review quality high. We do not post reviews by company employees or direct competitors. Validated reviews require the user to submit a screenshot of the product containing their user ID, in order to verify a user is an actual user of the product. Hi there! Are you looking to implement a solution like SaaSoptics?